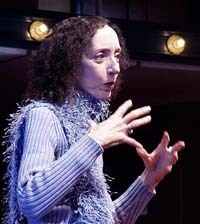 Joyce Carol Oates spoke at Davidson College recently. She was the inaugural guest of the Joel Conarroe Lecture Series, a new program that will annually bring a noted author to that campus. Joel Conarroe retired December 31 from seventeen years as president of the John Simon Guggenheim Memorial Foundation. He was chair of the English department and dean of arts and sciences at the University of Pennsylvania, and executive director of the Modern Language Association. He is the current president of the PEN America Center. He has also written and edited books and essays about American poetry and fiction, including his hallmark 1993 work, Six American Poets, and served on more than twenty literary juries, including the Pulitzer Prize jury. Of writing, Oates says, "I love to enter into the other world, the writing world, because everything comes alive for me there. It's another emotional realm where I visualize everything like a movie. I get so caught up in the characters and imagining what they must feel like that I can't think about anything else." She is one of this country's most prolific writers.